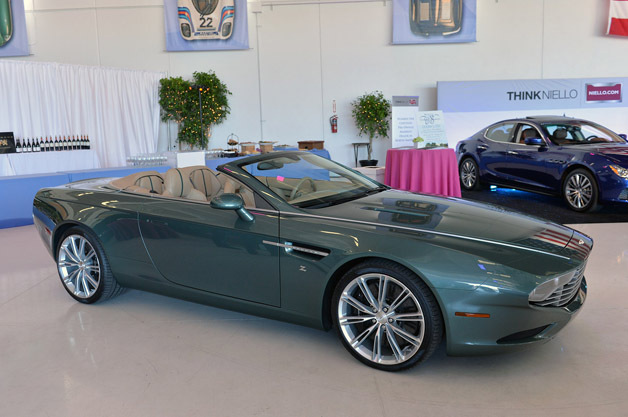 Aston Martin had an overwhelming presence at Motorworks Revival. Besides the production models on hand, including the new Vanquish Volante and V12 Vantage S, the British manufacturer brought a One-77 and held the live debut of the DB9 Spyder Zagato Centennial. This was one of two one-offs commissioned by Italian design house Zagato, in honor of Aston's year-long, hundredth birthday celebrations. We got our first official peek at the Spyder Zagato in July, along with its sibling, the DBS Coupe Zagato Centennial. The Coupe was set to go to a Japanese entrepreneur, while the model you see above was slated for Aston Martin collector Peter Read. Based off of the DB9 Volante, the Spyder Zagato ditches that car's sleek styling in favor of something, um, squarer? The results are up for debate. Have your say in the comments, and be sure to take a look at our live gallery of this one-of-a-kind Zagato.